Succulents from Cornwall-based nursery Surreal Succulents on display at the Hampton Court Palace flower show. Photograph: Jane Perrone. I am frequently asked - where do you buy your plants? So here’s my potted guide to the best places to purchase houseplants in the UK (if you’re in the US, click here). Included here are many recommendations of my own, plus several from listeners who I petitioned on Twitter for their favourite places to buy plants - you can read the whole thread here. Check out: There are various UK based swap groups on Facebook including Houseplant Swap Club - UK and Succulent Leaf Share UK. You can pick up some cheap houseplants from the likes of B&Q, Homebase, Tesco and Waitrose, but its usually the "usual suspects" rather than anything particularly unusual. Try to pounce on them as soon as they come into the shop, as most stores give plants no attention or watering once they’re on the shelves (top tip: Lidl's plant deliveries seem to arrive on a Thursday - go on Sunday and they are usually mostly gone or half dead). Labelling is hit and miss to say the least, (often it's just one word; "succulent" or "fern") but it’s a good way of getting plants locally if you’re on a tight budget. One last hitch - these plants are often potted in poor quality compost - or sometimes the wrong compost entirely - so consider repotting plants as soon as you get them home. And the whole glittery/painted succulents thing? I'll tackle that in a different post but please, just... don't. Check out: Wilkinsons seem to have occasional "motherloads" of nice succulents from time to time over the summer, and Morrisons has the best houseplants of the supermarkets, in my opinion. Prick cactus boutique in London. Boutique houseplant shops are popping up all over the place, and they are a great way to get expert advice on your plants and become part of the local planty community: you’ll pay a little more, but you get top quality advice, well-packed plants and an inspiring place to shop. I’ve divided the list below into regions of the UK so you can find places closest to home. Prick is home to a wonderful display of cacti and succulents (see episode 25 of the podcast for an interview with owner Gynelle Leon). Conservatory Archives in East London is one of the most established houseplant shops in the capital: there are two branches to choose from. Geo-Fleur in Walthamstow, East London is one of the more established of the new generation plant shops in London, having been established in 2014. Pearspring Plants is located in the SE London neighbourhood of East Dulwich: a must-visit if you are ever in London. Toro in Falmouth sells a range of houseplants plus ceramics to put them in. Hutch in Exeter sells houseplants and terrariums. Flourish Manchester came to my attention when they did a fabulously imaginative houseplant display at the RHS Tatton show - they sell online too with an innovative 'limited edition', including some pretty hard to get plants, so are definitely worth keeping an eye on! Plant Shop Manchester was born following a trip to Australia in 2016. You can hire out this leafy space for special events, too! Botanic in York is definitely on my hit-list of plant shops I need to visit. The Plant Den in Norwich has a really fun Insta account showing off customers and their newly bought plants. I really want to visit this one! Scaped Nature is a new indoor gardening/aquascaping shop in Norwich which also sells kokedama and terrarium setups. Jyngl is a popup plant shop, so if you’re in Wales it may be popping up at a market or event near you soon! Some of the mail order seed and plant outfits are now cottoning on to the popularity of houseplants: Suttons sells a range of interesting begonias, Streptocarpus and African violets which are supplied by the specialist nursery Dibleys, while Crocus sells a good range of plants too. One of the major players is bakker.co.uk: I have ordered from them in the past and the plants were not bad, but I have heard gripes from other customers about their customer service. I haven't tried Best4Garden but they seem to have a reasonably big range of houseplants. Hortology has a large range of plants and a stylish website, and sells a large range of pots, too: I haven’t tried this one but I have heard good things about them. I'd also recommend Shrubland Park Nurseries in Suffolk which has a lovely range of houseplants available via mail order, and Perfectplants.co.uk, an online garden centre in East Sussex which sells an impressive range of houseplants from its hothouse (pictured above). I have recently discovered the world of vivarium supply shops as a source for interesting houseplants: these may not be your obvious choice, but they are a great way to buy certain plants such as bromeliads, vines and ferns: things that will do well in the high humidity setting of a closed terrarium. They are sometimes sold in pots but also as rooted cuttings which, provided you are confident at potting them up, are a cheap way of getting more plants. I’ve bought from Dartfrog and rainforestvivs (who sell on eBay.co.uk) but there are many more. Ebay sellers can offer a way of getting hold of rarer plants and seeds, but it’s a bit of a “buyer beware” situation, particularly if you are ordering seeds from outside the UK - I have heard of people getting burned with seed packets containing chaff or something thy clearly didn’t order. Postage costs can be high, too. After a period when many garden centres ditched houseplants aside from as a seasonal extra, they are now realising there is money to be made and ramping up their offerings again. Some are still on the rather boring side, but if you’re lucky you may have an excellent source of houseplants on your doorstep. If you're really lucky, they'll also have an active social media presence, too. Perrywood in Essex (their Instagram account @perrywoodhouseplants is shown above), Bodmin Nursery in Cornwall, Clifton Nurseries in London and Surrey, Ayletts in St Albans, The Secret Garden Centre in Crystal Palace, London and Alleyn Park in West Dulwich, London, and all got shout-outs on Twitter; the best garden centre near me (Bedfordshire) for houseplants is Frosts. I've also heard very good things about Ferndale Garden Centre south of Sheffield, N1 Garden Centre and Dulwich Pot and Plant Garden in Dulwich, London, but haven't paid a visit to any of them myself - yet! Craig House Cacti at Chelsea 2017. 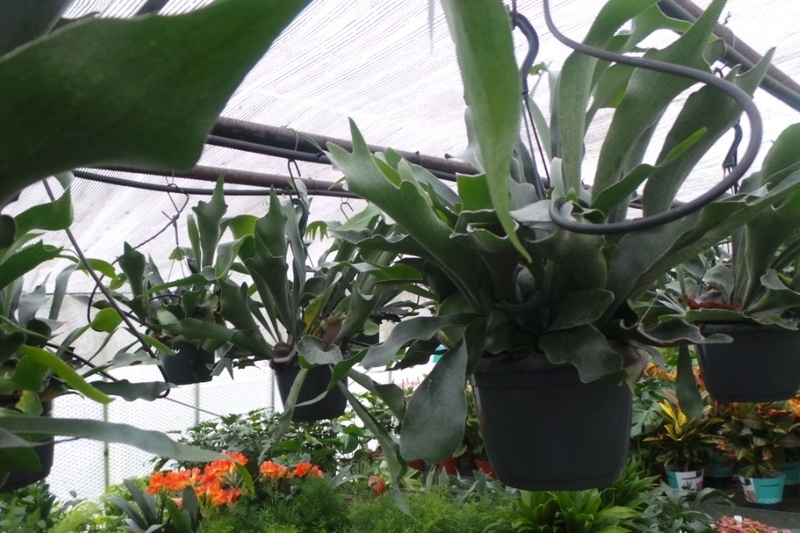 If you have a passion for a particular type of plant, be it orchids, cacti, Tillandsias or carnivorous plants, one of the best places to head for is a specialist nursery: either by mail order or, ideally, in person. These guys really know their stuff, and while not the very cheapest, you are ensured excellent quality plants and great aftercare. If you are looking for orchids, Burnham Orchids in South Devon comes highly recommended, while the nursery at the Salutation in Kent has an eye-boggling selection of Plectranthus. I've bought wonderful cacti and succulents from Cactus Shop in Devon and fell in love with Craig House Cacti at last year's Chelsea. Surreal Succulents based in Cornwall offer an excellent selection of, you guessed it, succulents! There are of course dozens of specialist nurseries out there: use the Independent Nurseries Guide to find what you are looking for, or visit one of the big plant fairs or flower shows such as Chelsea or Hampton Court to meet the growers in person. You can get subscription services for everything from hot sauce to handbags now, so not surprising, then, that some have popped up for houseplants. They suit some people down to the ground: a great way of getting new plants delivered straight to your door without having to trawl around for them. Andrew O'Brien has written positively about GeoFleur's Plant Post Club, and I've also heard good things about Lazy Flora and Hello Patch. There’s also Bloombox Club, which I haven’t heard much about, so please let me know if you’re a customer! Chiltern Seeds (UK-based) have an extensive collection including cacti and succulents, Episcias, Clivias and Coleus. Seedaholic (UK-based) have various succulents, Coleus, and Strelitzia. Jungle Seeds (UK-based), who have Christmas cactus, Adenium obesum (desert rose) and others. Silverhill Seeds (South Africa-based) sell a huge range of South African natives, mostly succulents. SuccSeed (Sweden-based) sell a range of cacti and succulent seed. UnusualSeeds (serbia based) have an Etsy shop selling a wide range of succulents and carnivorous plants: particularly good for Adeniums. I'd like to keep adding to this guide as I find - or you tell me about - great new suppliers, so please get in touch if you want to tell me where you source your plants in the UK. Here’s my pick of planty gifts to give to your loved ones (or yourself!) this Christmas - all handcrafted by small businesses or individuals.